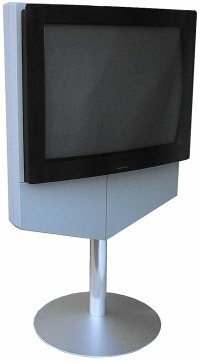 By adding the mechanical parts and MPEG panel from a DVD 1 DVD player to the BeoVision 1, an excellent replacement for the disastrous BeoCenter AV5 was made. Text copyright © Beocentral. Unauthorised reproduction prohibited. The DVD player fitted in neatly beneath the picture tube, an installation made invisible by the clever design of the disc loading drawer. On touching a silver bar below the screen, the drawer assembly first dropped down, then an aluminium holder slid forward just far enough to take the disc. Visually, this was a superb solution, and was marred only by the coarse noise made by the gearing inside. The player could play DVDs of course, and using the sound-only mode of the television, normal CDs too. The excellent quality of the built in loudspeakers meant that for a small room the BeoCenter 1 could be used in place of a conventional Hi-Fi system, and was made extra useful in this respect by the inclusion of an FM radio, the electronics for which were packaged with the DVD player assembly. Text copyright © Beocentral. Unauthorised reproduction prohibited. Once again, ease of use was compromised by the senseless Beo 1 terminal, which was bad enough just operating a simple television, but with the other sources and functions it was all too much, and some owners opted for a Beo 4 instead. Text copyright © Beocentral. Unauthorised reproduction prohibited. In early 2004 the introduction of a new DVD drive made by Pioneer of Japan (first used by B&O in the BeoCenter 2) meant that the DVD section had to be redesigned. Basic functions remained similar but the new models could be recognised by the different and slightly more elaborate on-screen menus. Text copyright © Beocentral. Unauthorised reproduction prohibited.